After an award-winning year on the festival circuit, Nevertheless, She Auditioned is ready to be seen by the world! 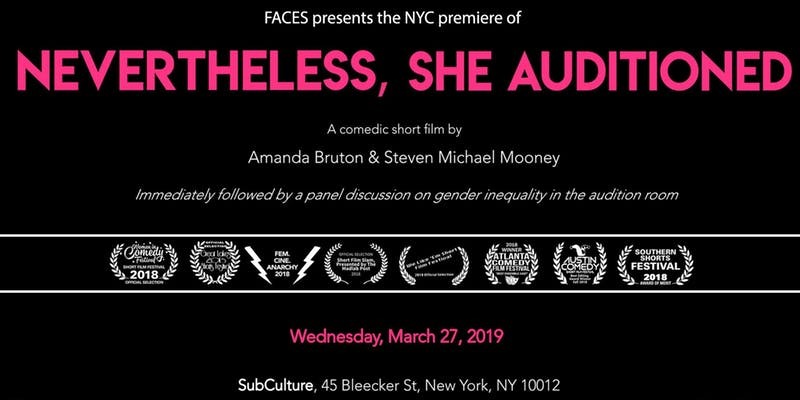 To celebrate the short film’s upcoming online release on March 29th, FACES is once again partnering with writing/producing duo Amanda Bruton and Steven Michael Mooney, to host its NYC premiere. Join us during the last week of Women’s History Month for a FREE advanced screening of the film, then stay for a stand-up comedy set, courtesy of Anna Suzuki. Besides her hilarious turn as NSA’s dejected heroine, she has recently appeared in Second Act with Jennifer Lopez, Spike Lee’s Netflix TV series She’s Gotta Have It, and HBO’s High Maintenance. And what’s a night of comedy without an insightful reality check? To round out the evening, a diverse panel of fierce women, including Amanda Bruton (Actor & Filmmaker), Erica Jensen (Casting Director & Co-Founder of She-Collective) and Sheri Sanders (Actor & Creator of Rock the Audition), will take a deeper dive into the real-world challenges that served as inspiration for the film. Moderated by Brittany Rostron (FACES Founder & Executive Director), the interactive Q&A will cultivate an honest discussion about the various obstacles still facing women, especially women of color, when it comes to both casting and auditioning within the confines of an often unyielding and antiquated industry. It promises to be an evening filled with laughter and empowerment, mixed with a tinge of frustration and anger… a truly perfect third act for this year’s Women’s History Month. The event will take place ahead of NSA’s official online release on Friday, March 29th at 3:00PM in anticipation of the 12th Annual International SWAN Day (Support Women Artists Now). Learn more about our programming, aimed at helping women break into and develop their careers in the entertainment industry by visiting FemaleACES.org, and @femaleaces (Facebook, Twitter, Instagram).